"It's a joy to work and live with beauty and to share it with others!" Perry D. Slocum's philosophy characterizes not only his life, but also his life's work. 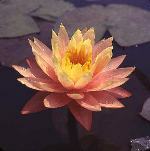 Known throughout the world for his hybridizing of water lilies and lotuses, Perry is truly an American legacy. Born near Cortland, New York, in 1913, Perry was raised on the family dairy cattle farm that also grew certified seed potatoes. Living amidst woodlands, streams and meadows, Perry developed an early interest in wildlife, including both plants and animals. 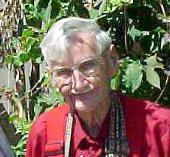 His present photography expertise began in those early days with efforts to photograph butterflies and wildflowers with a Brownie box camera. Perry especially recalls a fascination with the widened bays and coves of local streams, commonly known as "cricks". 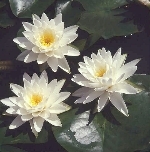 At 13, Perry and his younger brother, Beryl, ordered three water lilies from Johnson Water Gardens in California -- the hardies marliacea 'Chromatella' and 'Conqueror' and the tropical 'Blue Star.' The three lilies were planted in an iron kettle normally used for scalding hogs. The profuse yellow, red, and blue blooms began a love in Perry that eventually became his life's work. concrete. The hole was dug out by hand. Dirt was wheeled away in a wheelbarrow. A sturdy frame was constructed to hold the wet cement that was mixed in a wooden vat. The concrete was shoveled into the form, metal rods added for reinforcement in the cold New York climate, and the top smoothed with a trowel. Finally, 10 inches of soil and rotted cow manure were shoveled into the pond and the water and lilies added. The lilies grew and multiplied. Three years later, the crowded pond supplied the lilies for an earthen pond Perry and Beryl created below a spring in one of the family cow pastures. Perry's love of the lilies was interrupted when he went on to Cornell University to earn his Bachelor's degree and then on to 2 years at Syracuse Medical School. But the lilies beckoned. In 1938 his lifelong path was forged with a small water lily display at the Cortland County Fair. The first price list for "Slocum Water Gardens" accompanied the exhibit. A cousin's photograph of a young girl standing in the pond with a water lily cupped in her hands was published in the Binghamton and Syracuse newspapers. Hundreds of visitors trekked along the country dirt roads to see the lilies bloom. Buying and developing 10 acres just north of Binghamton brought Perry's unique nursery closer to the mainstream. Imagine the shock and surprise when the Sunday newspaper bore tidings of the new Pennsylvania-Canada highway to pass through Slocum Water Gardens. The forced move of Perry's nursery created the institution we know today. Purchasing seven different properties along what is now known as Cypress Garden Boulevard in Winter Haven, Florida, Perry moved his lilies and lotuses in 1959. Perry's wife, Trudy, and 3 children followed in 1963. In 1978, envisioning a life of retirement in the beautiful North Carolina mountains, Perry sold Slocum Water Gardens to son Peter and his wife, Sarah, who own it to this day. Even his love of the lilies and the lotuses growing in the two ponds near his North Carolina cottage was not enough to sustain the newly widowed man. With the love of new wife, Maggie Belle, Perry found renewed enthusiasm for his plants, creating more ponds for his ever-increasing bounty. Maggie Belle's son, Ben Gibson, worked with Perry in the ponds. Probably Perry's most well known lotus hybrid occurred as the result of a friend's suggestion that he try hybridizing the native American lotus, Nelumbo lutea with the very double pink Nelumbo 'Rosea Plena.' Perry made eight crosses: 4 using N. lutea to N. 'Rosea Plena' and 4 vice versa. From those 8 crosses, only 2 seeds formed. Planting the 2 seeds the following year produced one weak seedling that was discarded and the other, an extremely vigorous plant that opened a very rich double pink, changing to creamy yellow with a pink flush over a three day blooming period. This changeable lotus was named 'Mrs. Perry D. Slocum' and is now the most popular and largest selling lotus in North America. 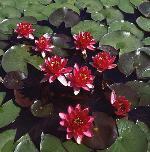 Perry's hybridizing efforts have been primarily focused on two goals: developing free-flowering hardy water lilies that are resistant to crown rot and striving for the elusive blue hardy water lily. Water lily crown rot is a highly contagious fungal-type infection that can destroy an entire collection of lilies. It is characterized by the leaf and flower stems becoming soft and blackened near the crown, and then progressively so upwards. Frequently, a flower bud will rot from its stem before it has reached the water's surface. As the disease progresses, fewer leaves are produced and those that are turn yellow shortly after unfolding at the surface. The tuber itself will feel mushy and smell quite rank. Perry has noted many of the old standard hardy lilies being susceptible to crown rot. The red lilies 'Gloriosa,' 'Charles de Meurville,' and 'Attraction' may die down with the disease. Pinks 'Masaniello' and 'Maurice Laydeker' can also be susceptible. Although 'Sioux' and 'Chrysantha' seem resistant, other orange varieties such as 'Comanche' are not. Likewise, the yellow 'Sunrise,' 'Chromatella', and 'Moorei' may succumb to the malaise. Even the white 'Hal Miller' and 'Virginia,' which Perry feels are white forms of 'Sunrise', are likely to be affected. In listing his favorite hybrids, Perry qualifies his selections by their beauty, freedom of bloom, and immunity to crown rot. N. 'Peaches and Cream,' a new hybrid with the plant patent applied for and pending, and 'Perry's Baby Orange,' which is still being tested for immunity to crown rot. N. 'Perry's Double White,' 'Mt. Shasta,' a huge bloomer, 'Perry's White Star,' and 'Venus,' a free-bloomer which opens a delicate pink and then fades to white. A new color in hardy water lilies offers N. 'Black Princess,' plant patent pending, and 'Almost Black' which is nearly as dark. 'Almost Black' may be susceptible to petal-edge bum on very hot days in the South, Perry cautions. The other of Perry's hybridizing goals, the blue hardy lily, is an exciting quest. At this time blue water lilies occur only among the tropical water lilies. The special challenge of trying to hybridize a hardy blue lily is overcoming the difference in chromosome count between the hardy and tropical species. Perry is experimenting with a secret chemical to surmount this problem. Both 'Black Princess' and 'Almost Black' are results of these efforts. Using a hardy seed parent, 'Perry's Fire Opal,' which forms a scrambling odorata-type rhizome, Perry crossed with two different blue tropical lilies. The resulting rhizomes are hardy, thick, horizonatal Marliac types. On another trip in 1973, Perry visited Gedye's Water Gardens in southern Australia. There he found two magnificent pink lilies, unflecked as were many of the pinks then available. Laurence Geyde told Perry that he was calling one of them N. 'Fabiola.' A floriferous dwarf plant, Perry imported it to North America. (This lily is now being called 'Pink Beauty.') The other lily at Geyde's was unnamed. Laurence allowed Perry to name it, Perry choosing the name N. 'Norma Geyde' after Laurence's wife. This lily, too, Perry imported to the U.S., it now being commonly available throughout North America. A charter member of the IWLS, Perry served on its board of directors for ten years, as Vice-president in 1987-1988, and as President in 1989 when its annual Symposium was held in Los Angeles. In spite of the time demands of continued hybridizing efforts and his involvements with the IWLS and friends, Perry still finds time to write as well. In 1988 Perry wrote the text for the Ortho water garden book, GARDEN POOLS AND FOUNTAINS. This venture into publishing prompted Perry to begin writing a book on water lilies and lotuses as an effort to straighten out the misidentifications of many of these plants. Perry shared his plans with the board of directors for the IWLS. Shortly thereafter, he received a telephone call from Richard Abel, then publisher of The Timber Press. Not only did Timber Press want to publish Perry's book, but they wanted him to expand it to be the most complete book on water gardening ever written. In 2001, Perry and Louise were married A delightful, charming man, Perry is always willing to share his knowledge and experiences. He advises we make certain to divide our water lilies, lotuses, and bog plants when they need it. Leaving them in crowded conditions can stress, weaken, and diminish the plants' vigor. Perry notes that while some plants may be left in the same roomy pot for two years, dividing and resetting each spring with fresh soil and proper fertilizers is usually necessary. Perry notes his satisfaction with Miracle Grow and Peter's 10-30-20 fertilizers. Until the publishing of Perry's new book, information on the care and growing of lotus has been sparse. Perry suggests using a strong hosing to knock away black aphids and, in some instances, to remove the European cornborer before it enters the plant's stem. Perry says this pest, which usually hides within a rolled edge of the lotus leaf, is best controlled by monitoring the plants and hand-picking the secretive larva. It is hard to imagine our ponds and pools without the beautiful lilies and lotuses Perry has brought us since the fateful day he decided to pursue a life with plants instead of medicine. His love of the plants has become our legacy, just as he has become an American legacy himself. Perry has sent an incredible collection of his photos for inclusion in this web site. Our scanner only just begins to capture the quality of the original large format slides. We are totally in awe of his talent, not only as a hybridizer but as a photographer! Enjoy them in Perry's Gallery.